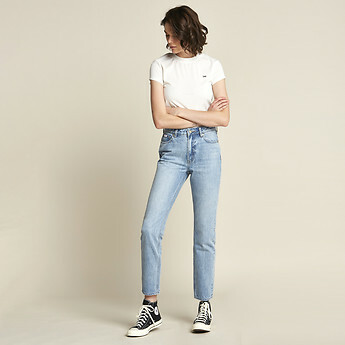 We're taking it back to the 90s with our High Pipes jean, modelled on a vintage slim straight fit. Worn high waisted, they fit tight through the thigh and more relaxed from the knee to the raw hem. Made from super soft rigid denim in faded blue wash with raw brass trims and tonal Lee embroidery on back pocket.